One of our classic best-sellers, Goodman's Five-Star Stories, supplements any literature curriculum or stands on its own by providing interesting fiction at just the right reading levels. 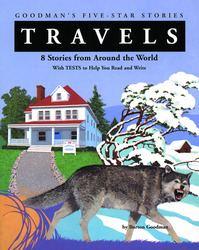 Adapted well-known short stories by traditional authors and newer multicultural authors entice even struggling readers with tales of adventure, derring-do, and surprise. Vocabulary in context, cloze passages, and critical thinking exercises help readers improve their understanding of the narrative text. Progress charts and graphs provide motivation to succeed. Students have concrete evidence of their improved reading skills. Open-ended response activities at the end of every selection invite creativity. These activities support both writing and discussion.